Sydney Uni is kicking off the preparation for their 2019 season this week – and the Australian champions are on a renewed quest to defend their Oceania title and qualify for the IHF Super Globe. After a successful first year, Sydney will continue their program with Navitas English, which offers overseas players free English classes while playing handball in Sydney. In 2018 Sydney Uni was able to step up its efforts to further develop Sydney as a hub for handball in the Oceania region, and boosting the reputation of handball from down under. Hiring German coach Michael Roth on a short term agreement for the IHF Super Globe in Qatar was considered a coup by many experts across the globe, and a number of high profile players from Germany and France followed – leading to a very competitive performance in Doha. An important part of the pulling power which Sydney Uni now has for handball players from all around the world is its collaboration with Navitas English, one of Sydney’s most popular and renowned language colleges. It allows overseas players to combine handball with improving their English, as well as experiencing the beaches and bustling city life of Australia’s biggest urban centre. Sydney Uni’s unique concept, with around half the squad made up of students and expats which stay for less than two years, creates new vacancies in the squad every year. But the management team around coach Lionel Puyhardy and captain Tomasz Szklarski are well used to the situation, and they actually attribute much of the success of the club to the constant fresh blood which brings new impulses for the team every year. One thing that never seems to change though at Sydney Uni is the unique spirit within one the most successful pure amateur clubs globally – former players often rave about the amazing handball adventure they had in the harbour city. Now, a new year lies ahead, and applications are open for new players to be part of the Sydney Uni team, 2019 edition. The milestones which lie ahead are the Oceania club championships which will be held at Australia’s Gold Coast in June, and then of course the IHF Super Globe – the official club world cup. If Sydney Uni qualify (which they did for the last seven years) they will travel to Saudi Arabia in September where clubs like Spanish champion FC Barcelona and the European Champions League winner will await. 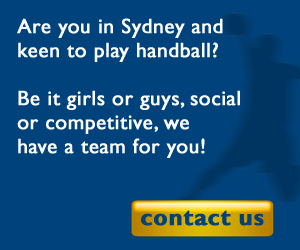 Players who are interested can contact Sydney via info@sydneyunihandball.com.